Auburn City Hall is located at 60 Court Street, Auburn, ME 04210; phone: 207-333-6600. Photo: Chase-Lloyd House, ca. 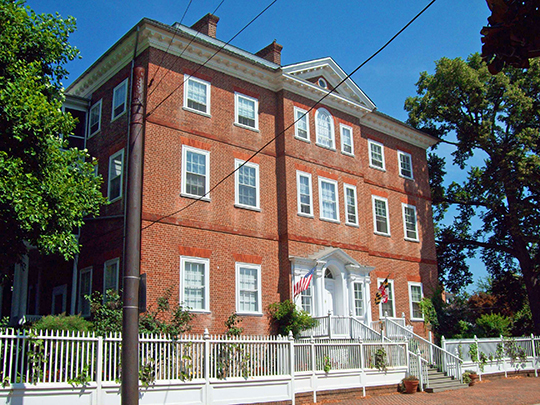 1769, 22 Maryland Avenue, Annapolis, MD. The District was listed on the National Register of Historic Places in 1970. It was designated a National Historic Landmark the same year. Photographed by User:Pubdog (own work), 2009, via Wikimedia Commons, accessed February, 2014. Auburn lies along the Androscoggin River opposite Lewiston and, together, form the Lewiston-Auburn Metropolitan Statistical Area. First settled about 1786, Auburn was incorporated in 1842. Auburn's name supposedly was take from the Auburn of Oliver Goldsmith's poem, The Deserted Village. The city lays claim to being the home of the shoe industry in Maine because it was still a part of the Town of Minot when the Minot Shoe Company was incorporated in 1835, in what later became West Auburn. Shoe manufacturing in the present city was begun a year later by two brothers, Martin and Moses Crafts. All shoe work was done by hand until about 1850. By 1865 there were 21 shoe factories in Auburn.